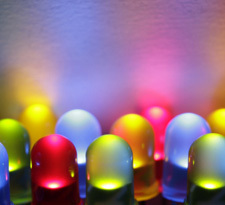 LEDs (light emitting diodes) are used in all sorts of clever things which is why we have included them in this kit. We will start off with something very simple, turning one on and off, repeatedly, producing a pleasant blinking effect. To get started, grab the parts listed below, pin the layout sheet to your breadboard and then plug everything in. Once the circuit is assembled you’ll need to upload the program. Start a new Netduino project in Visual Studio and use the code example below to create your programs. Ensure you’ve selected the Netduino USB device to deploy to (see the other beginner tutorials for instructions) and run the program to deploy the program to your device. First an instance of an OutputPort is declared, named ‘led’ and tied to GPIO pin 13, which is where we connected the LED. It’s initial value is set to false (off). An endless loop then cycles between two states. 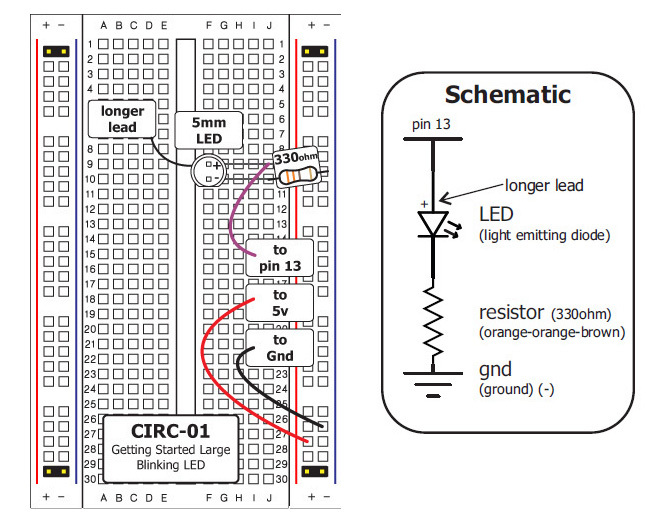 led.Write(true); sets the pin to HIGH which turns on the LED, likewise turning it to false turns off the pin and LED. Thread.Sleep(1000); instructs the microcontroller to “sleep”, or wait, for 1000 milliseconds, 1 second.